Though WordPress is known for its ease of use, setting up, and learning, getting started can be quite overwhelming. For a beginner, there will a lot of questions about the Content Management System. This article covers some of the most frequently asked questions about WordPress that will help you to get to know about WordPress more. WordPress is the most popular Content Management System that is used to create websites, blogs, landing pages, and online stores by people all over the world. Around 30% of the websites on the internet are powered by WordPress. The popularity of WordPress is not just because it is free to use, but also because of ease of use and ease of learning. WordPress allows you to manage the content of your website without even leaving the browser. WordPress is an open source software package that started in the year 2003. It is written in PHP and backed by MySQL database. It started out as a blogging platform for its users and it has now evolved to be the most widely used content management system for all kinds of websites and blogs alike. It is quite surprising for a lot of people that WordPress is a free, open-source platform. With all the good stuff that it comes with, it is hard to believe that this software package is free. The only inescapable cost of getting a site up using WordPress is of getting a domain name and hosting. One of the main reasons for WordPress being free is that WordPress is not owned by a single individual. It is the work of tens of thousands of community members who contributed to the open-source project over the years to create what it is now. When we say WordPress is free, we mean the freedom that it gives to the user to use, modify, build upon and redistribute the software. But WordPress is also distributed under a license, so there are certain things that you can and cannot do with the software. You can read about it in detail in WordPress licensing. People can make money by selling their products and services around Wordpress like commercial plugins or themes for WordPress. The major difference between the two is the hosting. While with WordPress.org, you have to host your own blog or website, you hosting is taken care of with WordPress.com. WordPress.org gives you more control over your website than WordPress.com. With WordPress.com you cannot upload any custom themes, plugins or modify the PHP code behind your site. Also, your domain name will include wordpress.com in it. You can opt for the premium upgrade that will allow you remove the ‘wordpress.com’ from the domain name and install from the limited premium theme and install plugins. With WordPress.org, you have the total control of the site, you can do whatever you want with the website, install plugins or themes, or create an online store, etc. But with the self-hosted WordPress, you are responsible for the maintenance of the website including upgrades and backups. Also, you will have regular expenses for the hosting services and if your website grows, you will need to go for a better hosting plan. How much coding should I know to use WordPress? Little to none. You really don’t have to be a coding expert to start using or create a full-fledged website using WordPress. With the right theme and plugins, you can get almost everything you want from a WordPress website. With the built-in features and the customization options that the themes and plugins come with are sufficient most of the time. But having some coding skills can be an added advantage. With no coding skills, you are limited by the features that the themes and plugins provide. What if you need that extra something out of the theme or the plugin that you are using? With no coding experience, you can either be happy with the way things are or you can hire a developer to make those changes for you which in turn is going to cost you money. If you have basic coding skills in HTML, CSS, and PHP, you can easily work your way around customizations. WordPress has a famous 5-minute installation process. The installation is very easy for WordPress. There are two ways in which WordPress can be installed. There is a one-click install and secondly, there is the manual installation. In the one-click install, most of the web hosting providers allow you to install WordPress in a click using the web host control panel. The service will also help you create a database and database user for WordPress. In the manual installation, the process is still simple but with a few added steps. You will have to download the WordPress files from WordPress.org and upload it via an FTP Client. Can I install WordPress locally? You can install WordPress locally on almost all operating system by installing a localhost like WAMP. WordPress is installed locally by developers for developing and testing WordPress themes and plugins. When installed on the localhost, you are the only one that is able to view the WordPress website, it is not available online for the people to see. So website managers use local installation to make changes to their websites before making them go live. What are the minimum requirements to run WordPress? You can upload WordPress via your WordPress dashboard, or alternatively, you can manually or automatically update WordPress. To update WordPress via the dashboard, you will always get a notification whenever a new update is available. You can directly click on Please update now or go to Dashboard > Update to begin the upgrade. At the end of the upgrade, you will get a success message. Alternatively, you can do a manual import in which you can download the latest version of WordPress and upload it using an FTP client. For an automatic update, minor releases are automatically updated since WordPress 3.7. Depending on the hosting, certain hosts also provide an automatic update for major releases. Just make sure to create a backup for your website and update all the plugins that you use to the latest version before you upgrade WordPress. How to start a blog using WordPress? To start a blog using WordPress, first, you are going to have to buy a domain name and a get hosting. After you have a domain name that helps users to reach your website and a hosting space, you need to install WordPress. Then you need to get yourself a nice looking theme, customize it to look the way you want and start adding your blog posts. For complete step-by-step instructions, read How to Start Your Blog Using WordPress. A WordPress theme is what determines the look of your website. Themes can include code files, image files, and stylesheets. Most WordPress themes provide the overall design style, layout, font, colors, menu and widget location etc to the WordPress website it is installed and activated on. To style your WordPress website or blog you can get hundreds of thousands of free and premium themes that you can install in WordPress to change the interface of your website. You can easily install free themes from the official WordPress directory. Also, you can get better quality and added features with premium themes. To install a theme in WordPress, go to the admin dashboard and on the left sidebar, go to Appearance > Themes > Add new. From the Add Themes page, you can search the WordPress theme directory for a free theme. If you find your theme from the theme directory, you can click install and then activate it. If you have a theme from sources other than you can install the theme by uploading the zip file of the theme. When using a free theme it is recommended not to use a theme other than from the official WordPress theme directory. To install a theme in WordPress, go to the admin dashboard and on the left sidebar, go to Plugins > Add New. From the Add Plugins page, you can search for a free plugin that you need from the WordPress plugin directory. If you have a plugin from a source other than WordPress plugin directory, you can also install the plugin by uploading the zip file of the plugin. If you are building a blog, you will be mostly using a post. Post are contents that appear in a reverse chronological order. They have the time of its publishing associated with it. The newest post appears on the top of the list. So the older the publishing, the deeper you will have to go to find a particular post. Pages in WordPress have your static content. Examples of a page in a website are the Home page, About Us page, etc. They do not have dates associated with them and are not arranged in the order that they are published. Also, pages are hierarchical, which means you can have sub-pages within a page. Tags and categories are used for sorting the content of your website so that your user has a better experience when searching for something. Categories are for general grouping the posts of the website. They help the user understand what the blog is about. For example, let’s say that you have a food blog. Then you can categorize the contents of your blog with different types of food like soups, desserts, beverages, etc. Categories are hierarchical. That means you can have a sub-category within a category. Tags are like the index of a book. They have the specific details of the book. By looking at the index, you can understand what all topics the book covers. Similarly, tags help to identify the topics that post is related to or the post covers. Also, tags are not hierarchical. How do I add and manage categories and tags to my posts? To add a category or a tag to a particular post, you can find a Categories and Tags section at the right side of the post editor. To add a category, you can click on Add New Category and a new category to the post. 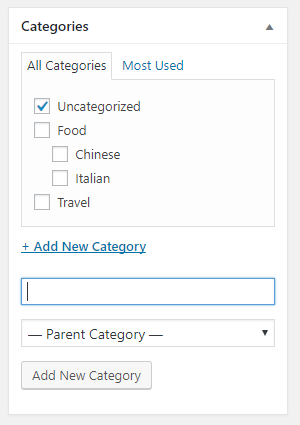 You can also choose a parent category if the category that you added belongs to another category. 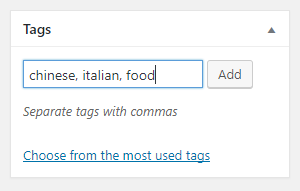 To add tags, go to the Tags sections and add the proper tags for the post and click add. Can I add categories and tags to a WordPress page? By default, you can only add tags and categories to posts. 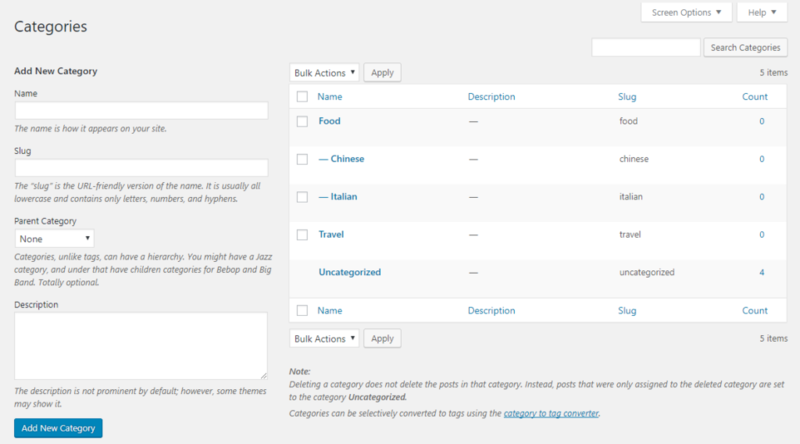 When you adding a page to your WordPress website, you can notice that there are no options to add categories or tags. However, there are specific plugins that can help you add categories and tags to WordPress pages. How can I add images and videos to my post or page? Adding photos, videos and other media file are very easy in WordPress. 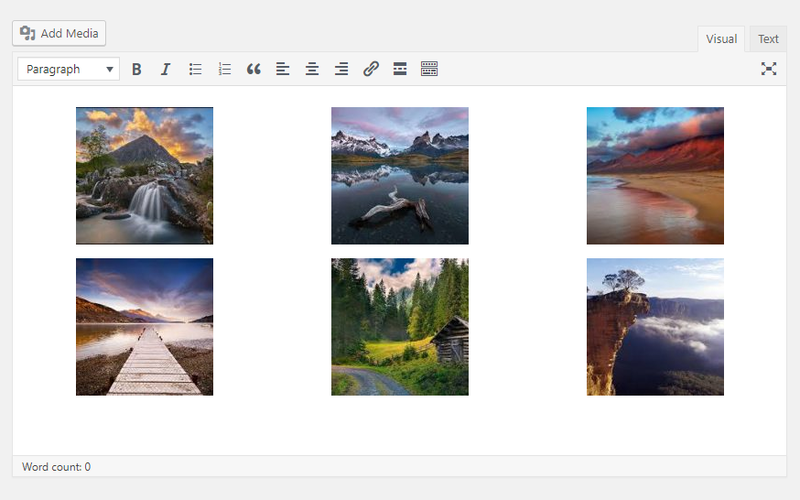 In the visual editor, click on Add Media and upload the media files to the WordPress media library. After you have uploaded the files, you can add the media file you wish to add from the media library by selecting the image and then clicking Insert into page button. Also, you can embed videos from popular video hosting sites like Youtube, Vimeo, etc, on a WordPress page or post just by pasting the URL of the video in the post editor. WordPress auto-embed feature will automatically get the code to embed the video into the post. Just make sure that the URL is on a separate line and not clickable. How do I show images in rows and columns in a post? To add images in columns, first, you will need to upload the images to the Website’s WordPress media library. After the upload, you will see the images in the media library. Now, select the images that you want to include and then click on Create Gallery and then click on Create a new gallery button. From the Edit Gallery section, you can change the Gallery Settings to set the number of columns you want, the size of the images, image link and whether to display the images in random order. Also, from here you can caption the images and reverse the order of the images. Next, click on Insert Gallery and a photo gallery will be included in your WordPress post. How can I set my homepage? To create a static front page for the site, go to the admin panel of the website. From the admin panel, go to Settings > Reading. From the Reading Settings page, change the radio button for Your homepage displays as A static page. Now from the Homepage dropdown, select the page you want to set as the homepage and from Posts page drop-down select the page that you want to set as your blog page. How do I add a featured image to my post? You can add a featured image also known as post thumbnail to a post from the post editor. At the right side of the post editor, you can see the Featured Image section. Click on Set Featured Image and select an image to be added as the featured image from the media library. How do I change my WordPress password? To change the WordPress password, from the admin dashboard, go to Users > All Users. Click on your username. This will open your profile page. Scroll down to the Account Management section and click on New Password. The automatic password generator will generate a password, that you will need to copy down somewhere. If you don’t want the automatically generated password, then you can overwrite the automatically generated password and the strength of the password will be shown just below it. After you have changed your password, scroll down and click on Update Profile to update your password. How to backup a WordPress site? There are many different ways you can backup your website. In the first method, you can choose a hosting provider that offers a full daily backup of your WordPress website. Secondly, you can create a manual backup your site by creating a copy of your WordPress files and creating a backup for the database. You can download your entire WordPress directory via cPanel or via SFTP. You can backup your WordPress site using plugins. There are a lot of free and premium plugins that you can install which will automatically create backups for your WordPress website. How can I improve the security of my WordPress site? Your WordPress websites can always be susceptible to malicious attacks. But you can always improve the security of your WordPress website by keeping some things in check. For example, pick strong passwords, you can use the autogenerated password for maximum security. Don’t use admin as your administrator username. Always install themes and plugins from trusted sources, keep WordPress up-to-date, keep the themes and plugins updated, and backup your WordPress site. These are some of the ways you can do to keep your WordPress website secure. A spam is any unwanted or malicious user content. Any unwanted content submitted by the users in the form of comments, user registrations, posts, contact forms, messages etc. Spams usually contain unnecessary links, links to illegal or inappropriate websites and malicious links which if clicked can cause harm to the computers of unsuspecting users who might have clicked on the link. How can I remove spam? There are several other plugins also, that can help remove and moderate spam from your WordPress website so that your website’s trustworthiness is not damaged. How can I improve the speed of my site? The speed of a website is very important for the SEO of the website. The loading time of a website has a major role in the Google ranking of the website. There are a lot of ways that the loading speed of the website can be improved. One of the main reasons that speed of the website is affected is because of the size of the images. This can be avoided by optimizing the size of the images. Now, you can do this by optimizing the images using image optimizations tools before uploading it to the media library or you can use plugins that can help you optimize the images for you. Never upload a video directly to WordPress. You can auto-embed a video in WordPress for popular video hosting websites like Youtube, Vimeo etc. just by pasting the URL of the video. You can also install a caching plugin, use a theme that is optimized for speed etc. Can too many plugins affect the speed of my site? It’s not the number of the plugins that can have a negative effect on the speed of your website its the quality of the plugins. You will need to avoid plugins that load too many scripts, plugins that add extra queries to the database, and mostly avoid using plugins from unreliable sources. If your a plugin is causing high loading speed to your website, then all you need to do is deactivate that plugin and find an alternative. How to drive more traffic to a WordPress site? To drive more traffic to your WordPress site you are going to know the basics of search engine optimization. The first that comes to mind to drive more traffic to your website is through social media. Let your friends and followers on social media know that about your site. Always post contents on your website regularly. Find the right keywords and use them wisely in your content. Question and answer sites like Quora can help you drive more traffic to your website. And importantly, install Google analytics. This will help you understand the results to your website. To know how well your website is doing, you will need the help of Google analytics. It will show you the data that is relevant to the improvement of traffic to your blog. Before you install Google Analytics to your WordPress, you need to have a Google Analytics account. You can sign up for Google analytics for free. After you have signed up for Google Analytics, you can use it for a site by installing a Google Analytics plugin like Google Analytics + or directly from the Google Analytics website dashboard.